Mayumi Ishino was born in Tokyo, Japan and currently lives in NY, NY. She received her M.F.A in sculpture from the New York Academy of Art. Ishino combines studio art, performance, installation, and video to create visual metaphors that distills complexity into simple forms. 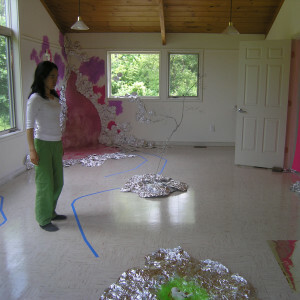 Her work focuses on the sensory and aesthetic experience on a primal/physical level. She has presented her work in national and international institutions including: Exit Art, NY; Art News Projects, Berlin, and 3rd International Performance Festival, Indonesia. She has received several awards including: Manhattan Community Art Fund, Immigrant Artists Project from NYFA, the Virginia Center for the Creative Arts, I-Park, and HRH Prince of Wales Prize.